I got the news today that our GoDaddy campaign has been renewed for another year, complete with new codes to save you money when you shop for domain registrations, renewals, website hosting and other services at GoDaddy. Here are the new savings codes. TRUTH5 gets you 10% off your entire order*. TRUTH6 saves you $5 off an order of $30 or more (over 16% savings)*. TRUTH7 gets you a .COM Domain Name for only $7.49 (over 25% savings). Feel free to bookmark this post for when you need it, or you can always refer to our GoDaddy Coupons page on the NOEBIE.com offers site. Thanks to GoDaddy and MEVIO for helping to keep The Frank Truth on the Net. 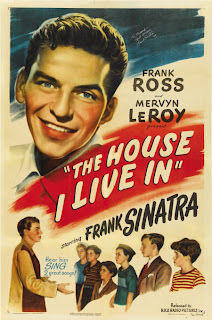 This week on The Frank Truth Sinatra Podcast, we've got a radio special from September 19th, 1945 with Frank Sinatra presenting The House I Live In. You may recall having seen a video of Sinatra's Academy Award winning short film with the same title on this program last April. Here's the MP3 for download, or you can subscribe to the show for free at the iTunes Frank Truth page. I hope that this audio version is as much of a pleasure for you as it is for me, and that it will give all of us something to ponder as we observe the Memorial Holiday. I believe that Frank Sinatra would be very proud, in some ways, of the progress we have made on issues of tolerance and equality over the years. I also believe that he would still be speaking his mind on the matter and advocating in the same fashion as always were he still with us. In a way, I suppose that he is. This podcast was licensed by BMI and ASCAP. The radio broadcast included in the program is a work in the Public Domain. We encourage you to purchase and enjoy legally distributed music. We finally had the opportunity to meet up with Doug and Nancy Barber in Indianapolis this weekend. It was a wonderful afternoon of friendship, excellent food and great conversation. More photos are on Doug's Flickr. There's a nice remembrance in honor of the day on the LIFE Magazine Website, including rare photos of Frank Sinatra that have never before been seen in public. Thanks to Natasha at Time/LIFE for sharing the link. You can see the full size photos here. This week on The Frank Truth Frank Sinatra Podcast we've got a special personal reminiscence from lifelong Sinatra fan, Anthony Vece. There's still time to purchase tickets for the Akron Symphony Orchestra's 2009 Fan Fair Event "Simply Sinatra" with guest vocalist Steve Lippia being held on Saturday, May 16th. Call the box office at 330-535-8131 and mention that you heard about the event from The Frank Truth to receive a discount on your tickets. I'm unable to attend the event myself this year, so I'm looking forward to first hand reports from those of you who'll be there, including our ticket winners Frank, Kyle and Dan. Thanks again to Jason from the Symphony for arranging the free tickets and discounts.